It’s that time of year again when there are gatherings, events, special occasions that we all are attending and as we all know there is a host or hostess behind all of it that is putting this together. Or maybe you are that host or hostess! 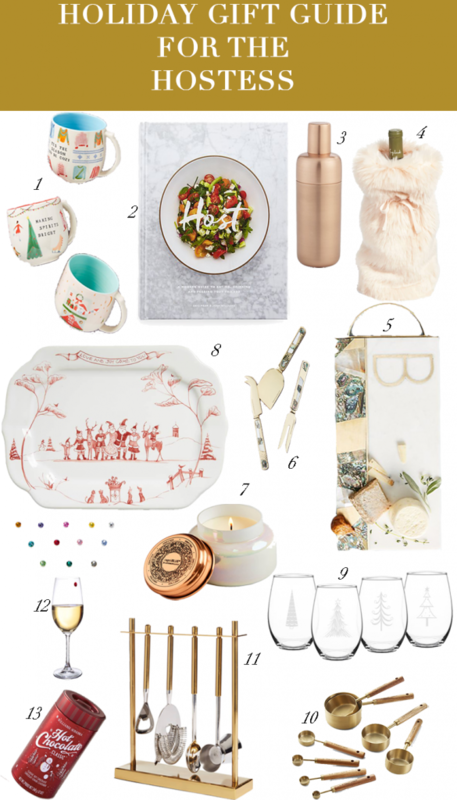 Hopefully this holiday gift guide for the hostess is helpful! 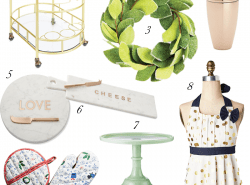 In this guide, you will find items that will be great to utilize on the day of a party or add a nice touch to the hostess’ home. If you are the host, I hope this guide inspires you for your party! I always think a cheeseboard is almost always a necessity in any event. Who doesn’t love to munch on cheese?! And this monogram cheeseboard is the perfect gift. The monogram gives it a personalized touch and the size is perfect for a good cheese spread or charcuterie spread. It also has a matching cheese knives set which I think is the perfect touch for your cheeseboard. I find this tutorial to be so helpful to create the ultimate cheeseboard! I have an obsession with coffee mugs and have 3 cupboards full of them! So getting cute coffee mugs are one of the best gifts to receive! You know they will be used – either for some type of beverage or for decor. These mugs are only $12 and with the addition of Williams Sonoma’s delicious hot cocoa mix, it would make the perfect gift set! 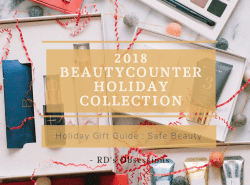 If you need more holiday gift guide ideas, feel free to check out the holiday gift guide section of this blog. These are the gift guides I’ve created so far: Holiday Gift Guide for the Traveler (most popular request) and Holiday Decor Inspiration. 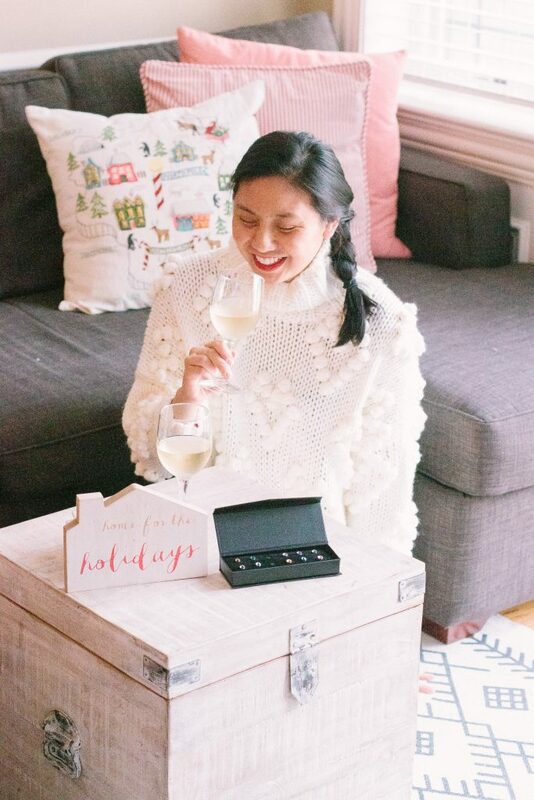 In this holiday gift guide for the hostess, I included Bliss Home Swarovski Crystal wine charms. Something about Swarovski Crystals adds a little glam to everything and these wine charms (in my opinion) are a must at parties! Therefore, I am giving you all an opportunity to win this Swarovski wine charm set! They are the cutest and so easy to use! All you have to do is follow the instructions noted in the Rafflecopter widget below. The giveaway will end on November 21 at midnight CST. You must be at least 18 years old and a U.S. Resident to enter. Good luck! That is the most beautiful cheeseboard I have ever seen! I would hate to hide it under cheese, haha. Haha I totally agree! They would make an awesome console table/buffet table decor! The Williams Sonoma Hot Chocolate is SO good. I get it every year! That is really good to know!! We host every year and I never receive a gift! I might have to send them all your gift guide! Love it all. What!! Girl you need to get a gift haha! That faux fur wine bag is AMAZING! These are all such great finds!! How did you find all of these? You definitely helped me out with some gift shopping! Thank you Ashley! Glad I was able to help! I love all of these hostess gifts! Oh my god I see I’m not the only one who’s all about that faux fur wine tote!! LOL it’s kind of awesome, isn’t it? Great ideas. 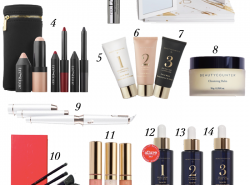 This is such a beautiful gift guide! I definitely agree that the monogram cheeseboard is the perfect gift, and those gold measuring cups are amazing! Great finds! I never knew I needed a faux fur wine bag until now! Cute picks! I always give wine as a hostess gift! Love that faux fur bag to gift it in! It is the best kind of gift! And I bet your hostess wold love the faux fur bag! That faux fur wine bag is the cutest thing ever! These are all such great gifts! I LOVE Williams Sonoma Hot Chocolate and their Peppermint Bark. I always buy a box of each every year! Thanks Jessica! Oo yes I love the peppermint bark too! Awesome gift ideas dear! The Bar Tool Set looks really cool. Thanks for these!